How does the Armored Hull Boat Shield™ work, and what does it do for your boat? The Armored Hull Boat Shield™ is a low-profile floating water barrier. Our system keeps your boat bottom free from debris & growth without lifting your boat out of the water! 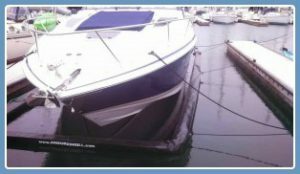 Once your boat is inside the Armored Hull Boat Shield™, pump up the air gate and now your boat is enclosed in its own self contained pool of water. This puts your boat in a clean environment where electrolysis is decreased up to 6 times and bottom fouling does not exist! 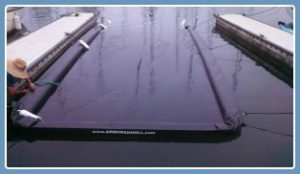 The Armored Hull Boat Shield™ floats on top of the water with a protective composite flexible shield beneath the water. 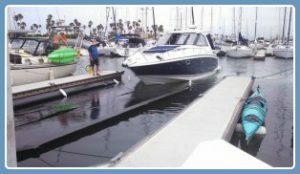 This system operates with a rear air actuated gate that lowers/raises to allow your boat to pull in and out. Once your boat is inside the barrier, the gate raises to enclose your boat in an isolated pool of water. What are some of the key benefits of the Armored Hull Boat Shield™? It is 100% environmentally safe solution to anti-fouling. Keeps your boat perfectly clean saving you time and money. No bottom paint means optimal fuel efficiency and boat resale value. If your boat ever leaks oil, or anything else that is hazardous, the Armored Hull Boat Shield™ isolates this for proper clean up. Helps docking by giving you a visible guide to pull into, kind of like a parking space. Installs easily and requires minimal maintenance. 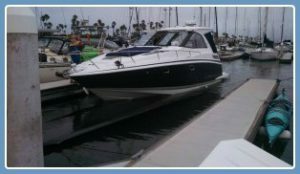 Makes boating more fun, easy, and safe with no timely storage procedure like a trailer or dangerous boat lift. Usually avoids any local permitting since this system is completely portable and simply ties to a dock the same way a boat does. Works with outboard, inboard and inboard/outboard boats. Is it hard to put an Armored Hull Boat Shield™ together? The Armored Hull Boat Shield™ is designed for easy installation. (1) Lay the Armored Hull Boat Shield™ out on the ground. (6) Drop in the water conditioning system assembly. The Armored Hull Boat Shield™ comes with complete, easy to do/follow assembly/use instructions. The Armored Hull Boat Shield™ can be completely assembled by one person in just a few hours. It's best to have two people when moving it from the land to the water. How do I secure the Armored Hull Boat Shield™ to my dock? Can easily be securely tied to a single sided slip, just as your boat would be. How much room does the Armored Hull Boat Shield™ take up in the water? The Armored Hull Boat Shield™ takes up about the same space as your boat already does, and only comes 5 inches out of the water. How do I operate the Air Gate™? Manual Air Gate™ pump operation: To lower the Air Gate™, simply open the dock side air gate valve, the air gate will lower in about 10-30 seconds. To raise the Air Gate™, simply attach the air-gate hose into the “inflate port” on the manual hand pump. Now, Pump it a few times until the air gate is raised and you see bubbles coming from the center of the raised air gate, then close the dock side air gate valve. How long does it take to raise the Air Gate™? About 30-60 seconds with the manual hand air pump. *Have more questions? Please contact us for quick answers!